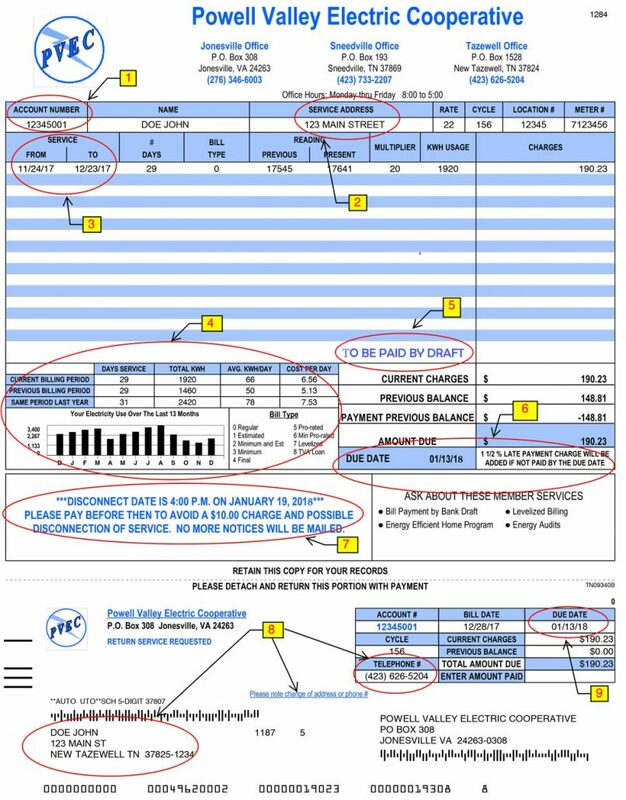 Below is an example of a Powell Valley Electric Cooperative monthly bill. We have explained some important sections on your bill and as always, if you have any questions concerning your bill contact your local PVEC office. Account Number – To help identify your account. Service Address – The 911 address for this location. Meter Reading Dates – These are the days of service usage for which your bill is calculated. The current bill due is based on the previous month’s usage. Usage comparison – This table compares the current bill with the previous month’s bill, and the same billing period last year. Key information includes days of service and average kilowatts used per day. Additional Information – TO BE PAID BY DRAFT – your account will be automatically drafted on the due date. Other messages that may appear on this line are: FINAL BILL – Account is inactive; CR BALANCE DO NOT PAY – Credit balance exists and no payment is required as of the billing date, LEVELIZED – Account is on average balance program. Late Payment Charge – The account will be charged a 1 ½ percent late payment penalty if payment is made after the due date. Disconnect Date – The account will be charged a $10.00 processing fee and is subject to disconnection if payment is made after 4:00 p.m. on this date. No further notices will be mailed. Please notify us if your address or telephone number has changed. Due Date – A payment made after this date will negatively affect your credit with Powell Valley Electric.